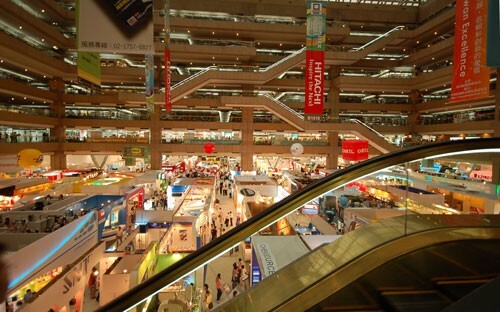 As the most important computer show for new products and prototypes that may or may never be seen on North American shores, COMPUTEX Taipei is truly a geeks paradise. This is the event where things like the ANTEC Skeleton, Thermaltake's Top Secret Universal Freon Cooler, and the newest ASUS Eee PCs and compact notebooks all come out in full force. However, strewn across the showfloor, there are quite a few treasures that go unnoticed and after detoxing from our journey overseas and dumping out our memory cards, we've remembered a few interesting things that we came across during our show coverage. There were two significant showings at abit this year at COMPUTEX. We were expecting motherboards, but we weren't prepared for this. Instead, we saw a small, Linux-based internet browser tablet and a digital picture frame that can also make 4x6 prints. The FunFab P80 printer (yes, the name is a bit ridiculous) is an 8" digital picture frame with a 800x600 resolution. It's a bit thicker than usual but with the press of a button, it very quickly pumps out 4x6 prints. The paper and ink come in the same cartridge (cost is roughly 30 cents a print) and the frame itself will retail for $199. abit's internet tablet is similar to those made by Nokia. Small seems to be the name of the game these days with everyone releasing something similar to Asus' immensly popular Eee PC. There isn't too much information right now as the product is still a prototype at press time. There are some kinks that need to be worked out, such as the camera's location. I swear I thought it was some kind of button as it is right under my left thumb. The ExpressCard in the slot is also probably not part of the final product. When ASUS fired across Creative Labs bow with the announcement that they would support EAX 5.0 with their XONAR Audio Cards, we expected the PC audio market to heat up. Although their cards already boast some of the cleanest output on speakers or headphones, I was totally blindsided when I saw this contraption. ASUS showed off a brand new two channel audio card called the XONAR Stereo X with a built in 1/4 inch (6.5mm) headphone plug built specifically for serious headphone audiophiles. The card drives the headphone jack with a full 1 watt amplifier so that your highest end cans will sound just right. The card also features full left and right channel RCA outputs for plugging into your favourite tube or high end two channel amplifier. Based on the same AV100 chip that the other XONAR cards use, it also features a 120db S/N ratio. The only thing missing were the tubes onboard. ASUS is currently investigating the viability of bringing this product to market, but if enough people pound on their doors, or SPAM our Forums with request, I'm sure your pleas will be heard and this may become a reality. Believe me, there are headphone geeks at ASUS and they want this just as much as you and me.